Ocean Warming Tied To Humans | "Global Possibilities"
Pacific and Atlantic Ocean zonal average cross sections (surface to 700 meters) of temperature changes for 1955 to 2011. 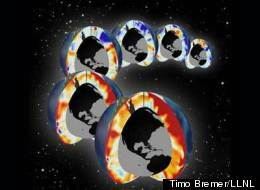 Each globe represents a decadal average. The foreground is the most recent decade and preceding decades are in the background. Red represents warming ocean, white no change, and blue for cooling with respect to a 1957-1990 average. Data was provided from the National Oceanographic Data Centre (NODC) World Ocean Database (WOD). Graphic by Timo Bremer/LLNL. Despite the onslaught of politicians attempting to project an air of question around man-made climate change, studies continue to emerge proving the connection between human actions and our changing environment. The most recent study, published in Nature Climate Change, finds an “anthropogenic fingerprint” (human influence) on our warming oceans. The study, “Human-Induced Global Ocean Warming On Multidecadal Timescales,” was conducted by researchers in the U.S., Australia, Japan and India. Based on observations of rising upper-ocean temperatures, the researchers used improved estimates of ocean temperatures to examine the causes of our warming ocean. According to a Lawrence Livermore National Laboratory press release, the study shows that over the past 50 years, observed ocean warming is explained only when greenhouse gas increases are included in the models. The recent ocean warming study has been released on the heels of other disturbing climate change reports. Arctic monitoring stations are now measuring over 400 parts per million of carbon dioxide in the atmosphere, a disturbing milestone that far surpasses the 350 ppm mark that many scientists consider the threshold separating safe from dangerous. Despite the ominous findings, some politicians are still attempting to project an element of doubt on issues surrounding human-induced climate change. A Virginia lawmaker recently fought to omit mentions of “climate change” and “sea level rise” from a coastal flooding study, telling the BBC, “The jury’s still out” on whether humans contribute to global warming. Despite his claim, studies such as the recent ocean warming one are turning in a pretty clear verdict.